I’ve got to admit, I’m a fan of grassroots environmentalism. Don’t get me wrong, there is most definitely a need and a place for the large scale environmental organizations. But to me, there’s just something really exciting about small, locally based groups of people taking part in the environmental movement, despite often limited resources or relevant professional background. Since the invention of the internet, even more so the resulting social networking tools, there seems to be even more opportunities to take part in these grassroots or community groups. With all the new, ever-evolving communication and social networking tools, such as twitter, facebook, etc, we as individuals have nearly direct access to more people and more community groups than ever before. We can easily connect with total strangers on issues and topics that we feel passionately about every day. An excellent example of just this sort of network is the nonprofit network Sustainable Communities ALL Over Puget Sound, aka SCALLOPS. SCALLOPS was founded four years ago to promote regional sustainability through the provision of resources and education for community level grassroots environmental groups. The network has grown to include all surrounding areas of Puget Sound, from Bellevue to Belltown, Capitol Hill to Carnation and well beyond. SCALLOPS holds regular events in the Puget Sound area, and is recognized as a highly valuable resource for new groups committed to sustainability. SCALLOPS’ mission is to network, support, and advance sustainability initiatives in towns and neighborhoods all over Puget Sound through outreach, education and community-building opportunities. My local chapter of SCALLOPS, Sustainable Kirkland, was kind enough to let me tag along to a meeting this past week. The small and close-knit group of environmentally conscious East-Siders discussed a number of topics, including a report on public opinion of GMOs (genetically modified organisms), the planning of group events – such as a tour of a local LEED certified building, and possible coordination of volunteers for the cleanup/maintenance of a local park. For more information about Sustainable Kirkland, check out www.sustainablekirkland.org. 1. Meet your neighbors. How often do you actually say more than a few words in passing, really? Community building is vital to neighborhoods, and environmental groups are an excellent opportunity to get out there and say, I’m a part of this community and I care about its sustainability. 2. Networking. By becoming part of a community group, you become part of an often already established support group. Coming together to express concern over local issues with similarly minded people often provides instant support, an instant network, and instant resources. It’s amazing how much is accomplished simply by knowing the right people. And if that network isn’t yet there in your community, well then – build your own. That’s what the internet is for. 3. Stay Motivated. Let’s face it, living green can be tough. It’s intimidating at the very least. All the indecipherable science reports, lawsuits, policy making…it’s enough to make the most dedicated environmentalist zone out if not throw up their hands in frustration. A group can be a reliable source of motivation, support and knowledge necessary to maintain your commitment. You have people who are there to not only support you, but also to hold you accountable. That’s a good thing, I promise. 4. Learn about the Environment. It seems like every other day, some new self-conflicting environmental study is published and promoted in the media. Reusable water bottles, they can be good for the planet but bad for our health? How ecological is buying a new hybrid really? The list goes on. By surrounding yourself with other people, often from a wide variety of professional, educational, and cultural backgrounds, you give yourself access to one of the highest prized resources, knowledge, as well as the opportunity to learn. 5. Get a Tan. Volunteering is highly underrated. It’s not limited to drudgery required by high school students, sorority houses, or community service. The chance to get outside (in many cases), meet new people, chat and bond as you plant a flower bed, dig up blackberry bushes, plant a few trees, or even pick up trash in a park. Yes, it’s work. No, there’s no pay, but chances are you’ll break a sweat, ride the resulting endorphin high, make some new friends, do a bit of good for the planet and your community, and maybe – if the weather plays nice – get a bit of sun. If you want to join a local group but don’t know where to start, if you’re in the greater Puget Sound area in Washington, I would highly recommend checking out your local SCALLOPS group at scallopswa.org. 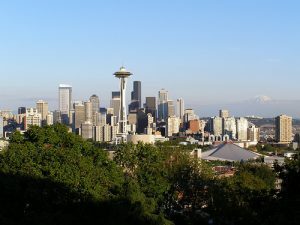 Also, www.iloveseattle.org has a great list of Environment/Green Groups & Organizations that is well worth a scroll through. If you’re not located in the greater Seattle area, a simple google search is bound to turn up enough hits to set you in the right direction. Greendrinks is also an excellent source, a self-described “organic, self-organizing network” of environmental groups dedicated to bringing people together from a diverse professional background, including NGOs, academia, government and business. Green Drinks events are available in an impressive 630 cities and 62 different countries around the world. So go on, get out there and do something good and green in your own backyard. People do need to do more to protect this planet. I think what really destroys the environment is the lack of education. And poor people are more likely to be uneducated. there are more poor people than rich, and it will always be that way. Our planet will be doomed, all we can do is slow down that process.